Service all your customers world wide from our Datacenters. Each one have completed SSAE 16 Type II Audit to ensure maximun security for your data, you never have to worry about outages again. Electricity is mantained to each facility throught redundant power feeds, backup UPS and redundant generators. We also have low data center temperature thanks to redundant CRACs, because cooler servers, always perform faster without the CPU having to throttle speed down due to high temperatures. We offer optimal routing across not only United States, but to Central and Latin America, Europe or Asia. An internet that doesn't sleep needs a dedicated team of technicians that are available to resolve issues within minutes of when they occur. Our data center is staffed with experienced in-house technicians around the clock that are never more than a few steps away from your servers. Whether it's a simple drive swap or a RAM upgrade, we have the staff and parts on-site to get the job done quickly and meet your needs on your schedule. Every dedicated server offered is physically racked using only server grade SuperMicro equipment in tier 3 and tier 4 facilities. Each facility is climate controlled to provide the optimal temperature and humidity for the hardware. 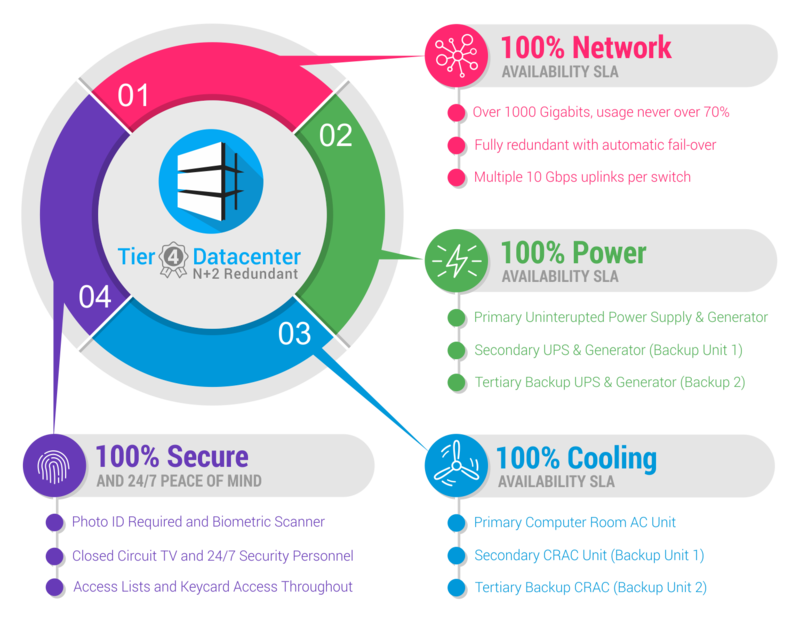 Every component within the data center, such as power, cooling, and network are fully redundant. We offer a 100% uptime SLA on power, cooling, and network operation for true enterprise grade availability. One of our highest priorities is to provide security for customer's data. All data centers are surrounded with a gated perimeter fence with CCTV surveillance. Access to any facility requires photo identification. Each of our facilities is staffed by security guards 24 hours a day, 365 days a year. Security within the data center is heavily restricted to specific floors, rooms, and cages that the individual should only have access to. Each floor and room requires a keycard and biometric verification. WE OFFER 360° DATA SECURITYThe highest level of security and N+2 redundant systems for maximum service availability.